Redemptorist Father John Kiwus, who served for a quarter of a century in the missions in Brazil, died suddenly on Dec. 27. He had been living at St. John Neumann Residence in Saratoga Springs, NY. The Funeral Mass was offered Dec. 30 at Mount St. Alphonsus in Esopus, NY, near his home town of Kingston. Burial was at the Redemptorist Cemetery at Esopus. The homilist, Father Francis Sullivan, a longtime friend and co-worker in Brazil, described Father Kiwus as "a super person — but the last one to realize it." Their confrere, Father Brendan Greany, told Father Sullivan that Father Kiwus was "the best man in the community I ever knew, always trying to make things easier for others." The son of Frank and Anna Geuss Kiwus of Kingston, NY, Father Kiwus was born Sept. 27, 1936. He attended St. Joseph School, Kingston High School and, for one year, Siena College before entering St. Mary’s Seminary in North East, PA, in 1957. He was professed as a Redemptorist in 1959 and was ordained to the priesthood on June 21, 1964. Father Kiwus served the first 30 years of his priestly ministry in Brazil, beginning in parishes, where he would bring the Sacraments to people scattered in numerous mission areas. Father Charles Hergenroeder, who was stationed with Father Kiwus for five years in Ponta Porã, said, "He was untiring in the chapel work and he took in 20 to 25 mission chapels in an area about the size of Rhode Island." In addition to his parochial work, Father Kiwus became a chaplain to a charismatic prayer group. He interested Father Hergenroeder in this ministry as well, he said. "I remember him as very, very kind to everyone and very zealous," he added. "He was a very prayerful man also, and he took time to be with his colleagues." A good athlete who especially enjoyed playing tennis, Father Kiwus found the opportunity to engage in his favorite sport only when stationed in Campo Grande, where courts were available, his fellow missionaries said. During his last years in Brazil, Father Kiwus served on the parish mission circuit, partnered with Father John Smyth. "For about six years, he was doing a lot of charismatic work and he had quite a few healings with that," Father Smyth said. "Altogether, we had about 100 people healed of cancer." It was in the 1990s that Father Kiwus was diagnosed with colitis, after going through a stretch of losing 10 to 15 pounds a week preaching missions, Father Smyth recalled. This illness was compounded with bouts of serious depression and, in 1996, he left Brazil and went for a year to the Villa in New Smyrna Beach, FL. Still battling what had become chronic depression, Father Kiwus nevertheless served the following year at Holy Family Retreat House in Hampton, VA, and, the year after that, at St. Anne Church in Sumter, SC. In 1999, he served at Our Lady of Perpetual Help in Manhattan. Two years later, he was assigned to Mount St. Alphonsus Retreat House in Esopus. While there, he served as chaplain to the Redemptoristine Sisters. Father Kevin Moley, Baltimore Provincial at the time, recalled how happy Father Kiwus was when he went up to Esopus to concelebrate Mass with him for the Sisters. "He told me it was one of the most beautiful times of his life and thanked me for allowing him to be chaplain for the Redemptoristine nuns," Father Moley said. "He said he found it a very fulfilling life and a great joy of his priesthood." Sister Paula Schmidt, prioress of the community at Our Mother of Perpetual Help Monastery, said Father Kiwus was "a very humble, holy and kind man" and "often shared with us stories from his mission work. He was very much loved by the Sisters." Sister Mary McCaffrey especially enjoyed his dialogue-style homilies. "He was a very gentle man and very contemplative," Sister Mary said. "He spent a lot of time after Mass praying and I know he really poured his heart out. He was very near to God and very devoted to people." Father Sullivan concurred that Father Kiwus was a very prayerful man, spending hours before the Blessed Sacrament and always devoted to Our Lady of Perpetual Help. "He was also a funny, funny guy," he said. "When he told a story, he’d start laughing before he got to the end and everybody else would be laughing too." It was only in the worst of his suffering with depression that he lost his joy and his smile, he added. 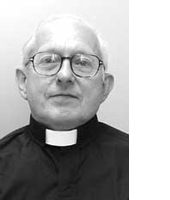 Father George Keaveney, rector of the Redemptorists at Esopus, said Father Kiwus "was a great gentleman, with a great sense of humor and very zealous. He was a delight to have in the house." As a former Baltimore Provincial, Father Keaveney was well aware of his confrere’s illness. "He really did battle the depression for years on end," he said, "yet he’d never try to put a burden on you. After a very agitated life, I’m sure he has peace now." Father Kiwus is survived by his brother and sister-in-law, Frank and Nancy Kiwus, and several nieces and nephews.